These little beauties are something that I always like to have a ready supply of in the freezer. 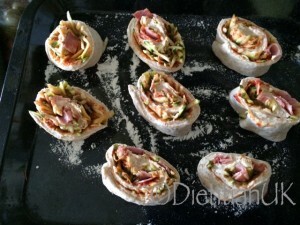 They make an easy lunch and are great to take out and about. We are in that stage where the toddler boy likes to eat lunch early which is usually when we are out and about, so lots of packed lunches are needed. Seeing as he isn’t keen on sandwiches I have to be slightly more inventive. 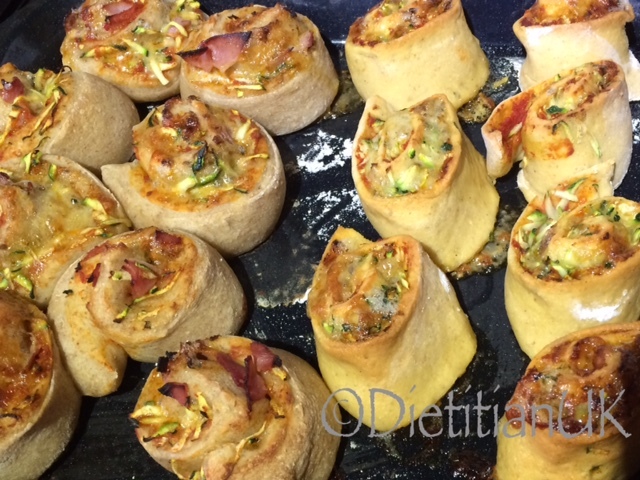 Savoury muffins, savoury flapjack and pinwheels all go down well. Courgettes are one of those vegetables that I love because you can add them into recipes without them being hugely noticeable. Grated courgette goes into a lot of things I make! Not don’t get me wrong, I’m not into hiding vegetables but I do like to add extra veggies to dishes when I can. My boy isn’t that keen on eating vegetables on their own so they need to be mixed into dishes. You could use any combo of toppings in these, be inspired by your fridge! You could use pastry to make these, however I prefer pizza dough. I tend to make a large batch of the dough in the bread machine, make pizza with half and then make these with the rest. Knock them up, bake and freeze in a freezer bag. They defrost pretty quick for an easy, healthy lunch. 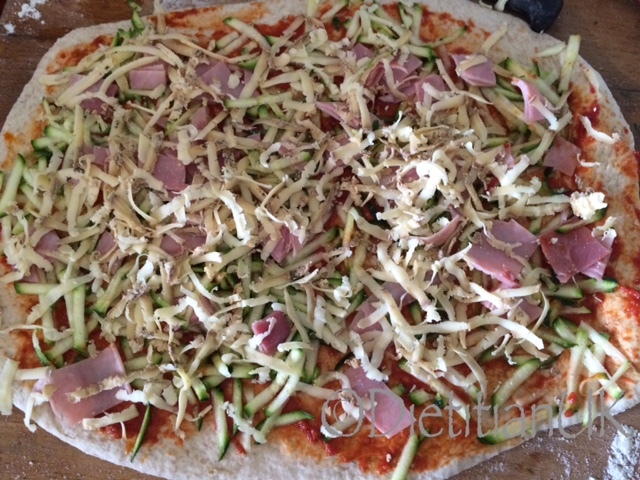 Here they are before baking…..
Make up the pizza dough, you could mix by hand and leave to rise or make in a bread machine. Roll it out on a floured surface, to a rectangle. Spread the tomatoe puree and pesto on the top. 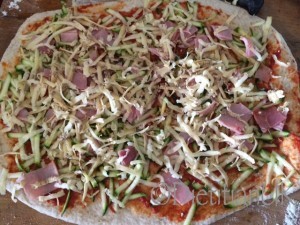 Cover with the courgette, stilton and ham. 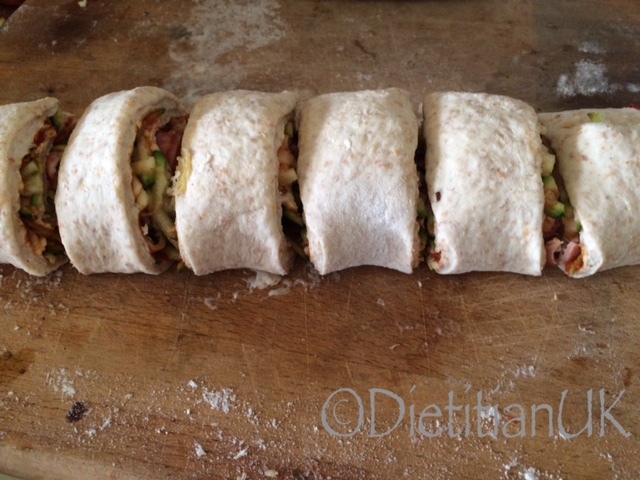 Roll it up longways (see picture) and slice into 2 inch pieces, it should make about 8-9. Grease and flour a baking tray, pre-bake the oven to Gas Mark 5. Turn each piece so the filling can be seen from the top (see picture). Place into the oven and bake for 20 minutes. 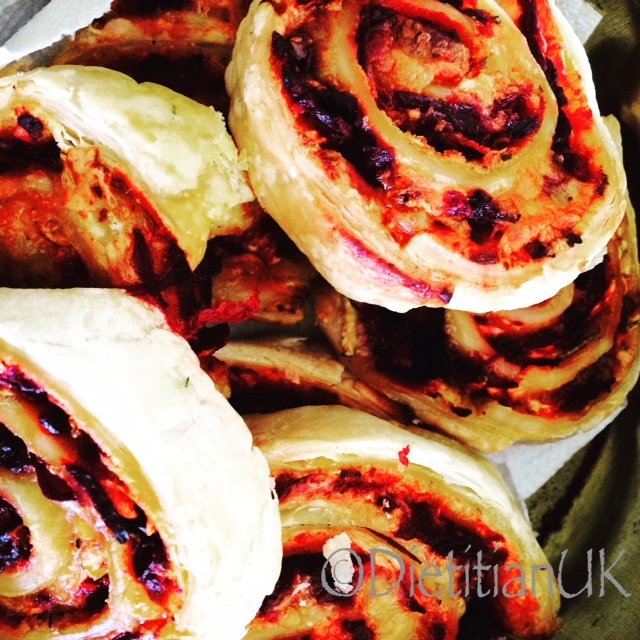 Beetroot, Courgette and Cheddar Pesto Pinwheels. I love a bargain and I love using up leftovers. This recipes combines both! Using some puff pastry I found reduced to 16p and the veggies that were in need of being eaten quick. This was a bit of a gamble as I haven’t cooked a whole heap with beetroot but the sweetness of the beetroot really works and it gives these a beautiful colour. Beetroot is packed with the phytonutrients: Betalain, a good antioxidant, this gives them their red colour. They also contain a good amount of folate, manganese and potassium plus provide fibre. Although puff pastry isn’t something I would recommend people eat everyday, this recipe is packed with veggies and makes a good alternative for lunches. Quick to make, easy for luncboxes. Let the puff pastry defrost enough to be unrolled. Spread on the tomato puree and pesto, mixing them together as you spread. Grated over the beetroot and courgette making sure the whole sheet of pastry is covered. Grate the cheese on top. Just a thin layer is fine. Slice into 10-12 pieces and place on a lined baking tray.